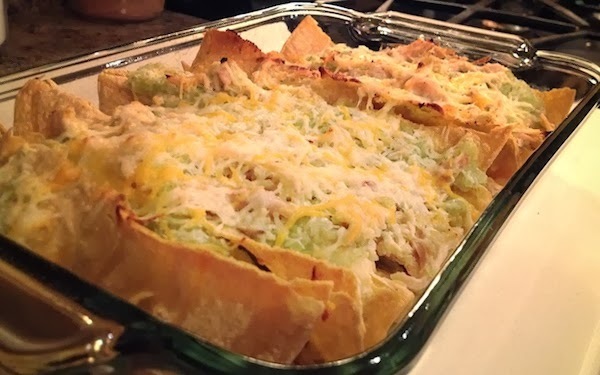 Enchilada Chicken Dip will all the taste of mexico. This dip will be a big hit at your next party it good and hot and you can make it spicy and serve with corn chips, "Try It" It's easy as A B C and 1 2 3 to make and have it ready for your family and friends fast and speedy. 1 1/2 cups shredded Mexican cheese blend save half Of the cheese. In a large skillet, heat the oil over medium high heat. Add the onions, garlic, peppers, salt, pepper, cumin and cayenne and coriander. Saute until almost tender. Add the chicken, the green chile sauce and the sour cream. Reduce the heat to medium and stir until the sour cream has melted into the sauce. Remove from the heat, Stir in 1 cup of cheese and transfer to a baking dish. Top with the rest of the cheese and Place in oven to 350 degrees bake for 20-25 minutes, until the cheese has melted and the sides of the pan are bubbling. Let set for at least 15 minutes before serving.